1 Gammon joint (depending on the size of your slow-cooker / number of people you are feeding!). This works well with both smoked or green Gammon. Approx ½ litre Duskin Apple Juice. I prefer Bramley, but you could use Cox, Gala, or any other sharp or medium variety. Lightly crush the cardamom pods and coriander seeds and then put them in your slow-cooker with the whole fresh chilli, whole black peppercorns, and piece of cinnamon stick. Place your piece of Gammon in the slow cooker, and pour over enough Apple juice to just reach the top of the meat. Put the lid on and cook for the time recommended by your Slow-Cooker instructions. If you are serving the gammon cold, allow it to cool in the spiced juice and keep refrigerated. If you are serving the gammon hot, you can make a sauce from the spiced juice you have cooked it in. Pour the juice through a sieve (to catch the whole spices) into a saucepan. Blend approx. 1 heaped tablespoon of cornflour with a little water until smooth. Stir the cornflour mixture into the spiced juice, and bring to the boil whilst stirring continuously. Boil for 3 minutes to thicken. 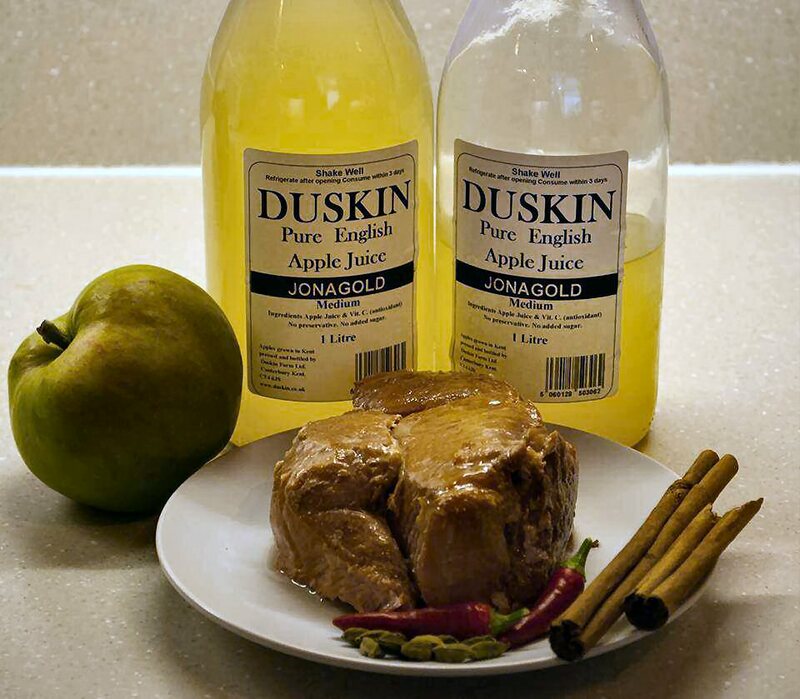 Serve with a glass of your favourite Duskin Apple Juice.